Warning No Lifeguard On Duty Swim At Your Own Risk Sign - 18x12 - Rugged rust-free aluminum signs for indoor or outdoor use. Made of heavy-gauge reflective aluminum with anti-weather and anti-graffiti protection Available. Swimming during the summer time is one of the most popular activities to do for both kids and adults. Manage your property and maintain safety by posting our No Lifeguard On Duty Warning Signs. Using our signage is a great way to notify swimmers they are swimming at their own risk and that children or adults who don't know how to swim should be cautious when entering the water. 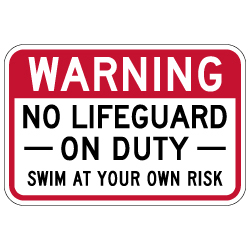 Posting No Lifeguard on Duty Signs is a great deterrent for reckless behavior and encourages safe swimming habits. Our signage is very popular to use for hotels or public swimming pool areas, around lakes near campsites, and beach locations where there is no lifeguard presence. DOUBLE the working life of your Warning Signs by adding 3M Protective Overlay Film (POF)! 3M’s high-tech POF protects sign faces against fading caused by the sun and harsh weather—and makes graffiti and sticker defacement damage easy to clear away without harsh abrasives.